This is one of those books that immediately after you start reading you know you are in the hands of a wonderful writer. Atticus Lish has delivered a delicately savage critique on post-9/11 America and the so-called American Dream in a beautiful love story of an illegal immigrant and an American soldier recently returned from Iraq. Zou Lei is a Chinese-Muslim who has escaped from northwest China and the wars in neighbouring Afghanistan. Alone, with barely any possessions or clothes Zou Lei is quickly set to work for long hours and small pay but is ostracized within the Chinese migrant community because of her Uighur-Chinese background. Despite this she embraces the small freedoms she now has and is determined to carve out a new life for herself despite the hardships. Skinner is an army veteran of three tours in Iraq. Recently discharged he arrives in New York looking for a good time. Looking to find ways to forget. Skinner was “stop lost” as a soldier. Administratively lost in the system and sent back for two more tours of Iraq. When he does finally leave the Army, America itself “stop losses” him. Damaged and scarred, mentally and physically, from his service Skinner is abandoned by the country he has just served to find his own way, find himself and try to survive in the country he has returned to. Lost, confused, alone and haunted by what he has experienced the portrayal of Skinner is one of the best I have read in terms of PTSD, its effects on the individual and its affects on those around them. Skinner and Zou Lei find each other and their relationship is unsentimental. Theirs is not a love story of passion nor is it one of forgiveness. It is certainly one of circumstance but they endure more than their situation. Skinner and Zou Lei both find in each other a glimmer of hope for a future. That together they might be able to overcome the situation they each find themselves in. Together maybe they can survive. They have found each other so therefore they might no longer be lost. But they must not lose each other or they could lose what little they have left. 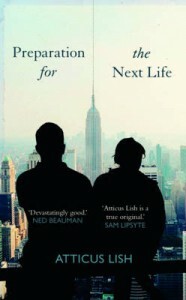 Atticus Lish’s writing is sharp, exact and deliberate carrying you through the lives of these two tragic figures. You are absorbed into Skinner’s and Zou Lei’s lives and their surroundings and the sense of being lost and abandoned is beautifully evoked through disconnected dialogue and the divide that exists between both Skinner and Zou Lei’s relationship and the world around them. This is a novel that permeates through you, long after you finish it and is a truly exception debut.